There are a lot of different name: mythic+, keystone, keys, mythic and for unknowing people it’s rather difficult to understand the difference. This guide will help you to understand what it means, what the difference between mythic and mythic+ dungeons is, what gear can you loot and other subtle nuances. What are Mythic and Mythic+ Dungeons? The table for 8.1 patch below shows the common differences between difficulty levels. Columns “Required level” and “Required item level” display minimum values, so that if you have lower – you can’t get there at all. The main differences between Mythic+ and Mythic dungeons are that in Mythic+ you have time limit (about 30-40 minutes), bosses and mobs are stronger and you get loot only after completing full dungeon. You need a key. What is the key? From last boss in Mythic Dungeon you will loot Mythic Keystone in specific dungeon. With this key, you can come in this M+ dungeon and near the entrance (inside) find a Font of Power, which is used to place your key and start M+ dungeon. When you insert the key you will see all affixes and increase of your enemy’s strength. You can see example on the picture. How does the key level change? If you haven’t got a key, then after mythic dungeon you will get +2 level key. It’s the base key level. If you completed the dungeon in timer, your key will be improve to the level from 1 to 3, depending on the rate completion. If you didn’t finish in time, your key will randomly stay the same level (may be other dungeon) or become lower for one level (with the same or other dungeon) – it means that you’ve broke the key. Anyway you’ll get loot. You can change nothing inside the dungeon, but you can use summoning portal to teleport from the dungeon during the timer. In every difficulty level (except Mythic+) you will have a cooldown on the dungeon. You can complete it the second time, but without loot. However, in Mythic+ there is no such restriction. In every difficulty level (except Mythic+) you can get loot from mobs and bosses. In mythic+ you will get loot only after completing full dungeon. Dungeon’s difficulty depends on the key level (higher – more difficult). 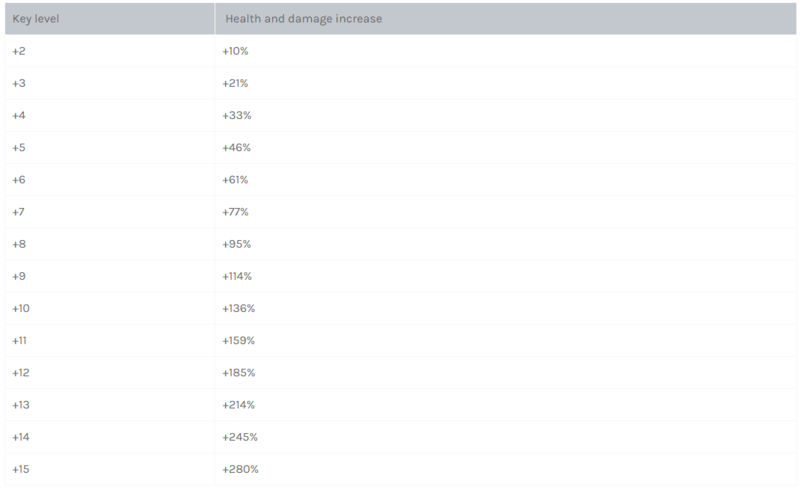 All enemies get +n% more health and damage, which you can see on the table below. It is different increases, which makes dungeons more difficult. They change every week and their amount depends from dungeon level. 4+ Affixes: Bolstering, Raging, Sanguine, Teeming, Bursting. 7+ Affixes: Necrotic, Skittish, Volcanic, Explosive, Grievous, Quaking. 10+ Affixes are seasonal, for second season affix is Reaping. You need to fill Enemy forces scale by killing trash. It’s one of the completing M+ condition. So only when you fill the scale (using some tactics) you can skip remaining trash. After completing each key you will receive reward, its item level depends on key level. In chest you always can find Azerite power. Your team will receive minimum 2 items. If you complete in timer – 3 and for 10+ keys there is a 40% chance to receive 4 items from chest. You can find completed Mythic+ Dungeons for week pressing “I” button. For weekly reward uses the highest key level and it doesn’t matter was it in timer or not.